Hailing from Barcelona, Spain, world-class choreographer Thomas Noone has turned his attention to something a little different. Usually concentrating on pieces without a narrative storyline, Thomas’ latest work has moved in a completely new direction. 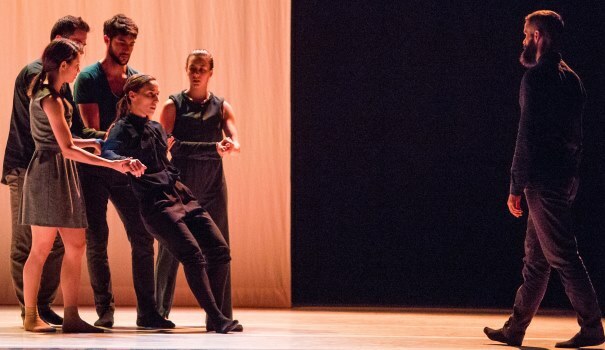 As part of a two-date tour of the UK, Thomas Noone Dance brings a contemporary twist on Euripides’ classic tale Medea to the PDSW stage. “Medea is considered to be one of Euripides’ best works and is included as part of the Western Canon – a body of works that Western scholars generally accept as the most important and influential in shaping Western culture. Euripides’ original Greek tragedy is based around the story of Medea and Jason, after Jason’s Golden Fleece adventures. In it, we see Jason’s betrayal of Medea with another woman, Glauce, the daughter of King Creon of Corinth. The work starts with Medea grieving over her husband’s deception. With the people around her, and King Creon, fearing what she may do. She is eventually banished from Corinth. However, after pleading, she is granted one day’s return. Unbeknownst to the people of Corinth, Medea plans to use this day’s return to get her revenge. Jason arrives to tell Medea that he is, in fact, not in love with Glauce at all but is unable to pass up the opportunity to marry a wealthy princess, especially as Medea is from Colchis and is considered a barbarian witch by the Greeks. He explains that he intends to eventually join the two families, keeping Medea as his mistress. Angered by Jason’s reasoning, Medea reminds him that she left her own people and murdered her own brother to be with him, meaning that she is unable to return home. She also speaks about how it was her who had saved him and killed the dragon guarding the Golden Fleece. However, Jason refuses to be moved by her words and, instead, offers to placate her with gifts. In response, Medea hints that he may regret his decision, as she plans to murder Glauce and King Creon. Medea is visited by Aegeus, king of Athens, who asks her to help his wife conceive a child through sorcery. Medea agrees, in return for his protection. Aegeus promises her safety if she is able to escape to Athens. Medea then sets about exacting her revenge, gifting a poisoned golden robe to Glauce who, Medea believes, will be unable to resist wearing it out of her sheer vanity. She sends her children, bearing the poisoned golden robe, to Glauce. Later, a messenger arrives with the news of Glauce’s untimely death. The plan works perfectly as Creon is also killed whilst trying to save his poisoned daughter. She also ponders the idea of murdering her own children as a way of hurting Jason. Medea struggles with the idea of killing her own children, speaking fondly of them, but eventually comes to the conclusion that she is merely saving them from the retribution of Jason and Creon’s family. Medea is co-presented with Lighthouse Poole. Thomas Noone Dance perform Medea at PDSW on Thursday 3rd March. For more information and to book, click here.